Having once been restricted by building laws, the height of most of Los Angeles' buildings is surprisingly low, partly due to the risk of earthquakes in the LA area. 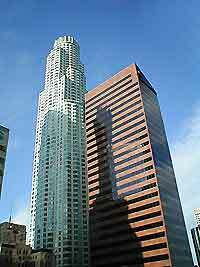 However, recent decades have seen downtown Los Angeles spring up into a glittering cityscape of towering skyscrapers, forming some of LA's most significant architectural landmarks. 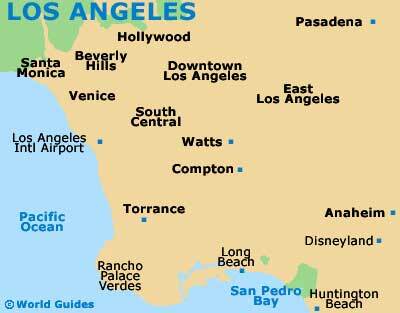 The city of Los Angeles is not enriched with the wealth of historical monuments that you can find in other US cities, although Los Angeles does contains a number of unique features, such as the Watts Towers and the Griffith Observatory, while LA's most recognizable landmark is the 'Hollywood' sign that overlooks the city from the Hollywood Hills. The Hollywood sign symbolizes the hopes and dreams of Hollywood stars and when you see it for yourself, on a smog-free day in Los Angeles, you are likely to get swept up with emotions that make you want to shout 'I've made it to Hollywood!' 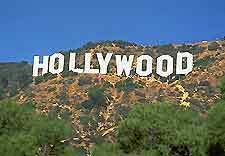 Should you be a little less dramatic, it is still worth a look just for the photo opportunities, although don't expect to get up close as the 15-meter / 50-foot high sign is right up in LA's Hollywood Hills. 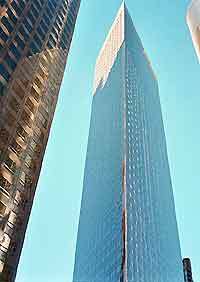 Recognizable from any picture of downtown LA's skyline, the Los Angeles 777 Tower is a shiny 53-story skyscraper, designed by Cesar Pelli and Associates in 1991. The lobby of the building is particularly exquisite, being fashioned almost entirely of marble, while the grounds outside offer relaxing landscaped gardens. Designed by architectural firm Pei, Cobb, Freed and Partners and situated in the heart of downtown Los Angeles, this building lays claims to being the tallest structure west of the Mississippi, standing at 73 storeys. LA's First Interstate World Center featured in the Hollywood blockbuster film 'Independence Day' and fans will remember it being dramatically destroyed by aliens. Based on Salt Lake City's Mormon Tabernacle and offering similar features with its large dome and organ, Los Angeles' Angelus Temple was opened in 1923 by Aimee Semple McPherson, the spiritual leader of what became known as the Church of the Foursquare Gospel. Interesting relics housed in LA's striking temple include crutches and casts discarded after purported healings that took place within the church. 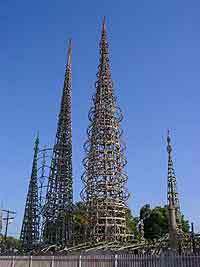 A truly unique Los Angeles landmark, this distinctive monument was the mastermind of construction worker Simon Rodia, who built it over three decades from 1921 to 1954. Key building materials of the mosaic towers include sea shells, glass, scrap metal, pipes and bed frames that join together to form a resourceful and creative work of art from which LA's usual glitz and glamour are absent. One of LA's most prominent landmarks, this impressive cream-colored Art Deco observatory was completed in the 1930s. The planetarium will interest those with a taste for astronomy, while others can simply enjoy the stunning city views of First Interstate World Center. The observatory is popular among cult film fans, having once featured in the James Dean film 'Rebel Without a Cause'. These shiny towers form two of downtown LA's most prominent landmarks, with their tinted glass windows and granite exterior giving the buildings a golden glow in the California sunshine. The striking Los Angeles towers were designed by Skidmore, Owings and Merrill in the 1980s, while the area between the two towers was designed by Lawrence Halprin and features a glass-walled garden which houses sculptures by well-known artists. Originally built to house menswear store Oviatt and Alexander in the 1920s, this important Los Angeles building has now been beautifully restored to its former glory. The interior is fitted with gorgeous Art Deco features, most of which were made in Paris. Having been featured in numerous Hollywood films during the 1940s, Union Station has become a landmark in Los Angeles. Formerly the main rail hub for all of Southern California, its recognizable white façade and arched doors and windows still make it one of the nation's great functioning railway stations.